Pack of 100 Certificates - Beatrice Foods Overseas Finance N.V. $1000 Bond - Price includes shipping costs to U.S.
Home > Certificate Quantities for Educators / Business Promotions > Pack of 100 Certificates - Beatrice Foods Overseas Finance N.V. $1000 Bond - Price includes shipping costs to U.S. 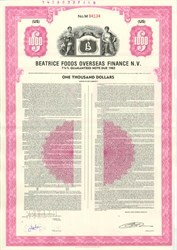 Beautifully engraved certificate from the Beatrice Foods Overseas Finance N.V. issued in 1978 for $1,000. This historic document was printed by the American Banknote Company and has an ornate border around it with a vignette of an eagle. This item has the printed signatures of the Company’s President and Secretary.